Nicolas Maduro has been sworn in as Venezuela’s new president, succeeding the late Hugo Chavez who died of cancer last month. Thousands gathered on the streets of Caracas to show their support for Nicolas Maduro and to celebrate independence. The inauguration ceremony follows a decision by the electoral body to carry out a full audit on all of the votes cast in Sunday’s disputed presidential poll. 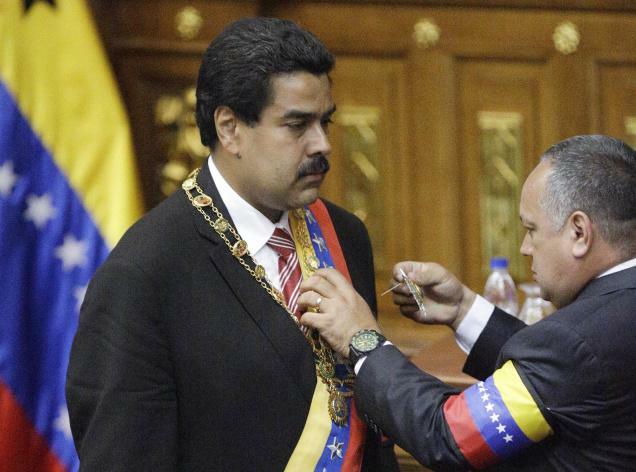 Nicolas Maduro beat opposition leader Henrique Capriles Radonski by 1.5% of the vote. Henrique Capriles, who believed there were voting irregularities, says he accepts the electoral audit. Opposition supporters were expected to protest against Nicolas Maduro’s inauguration by banging on pots and pans, and playing salsa music. Dozens of leaders from across the region (including Brazil, Cuba and Colombia), Iran and some Arab countries attended the ceremony. Henrique Capriles made an appeal for peaceful protests in a bid to avoid further violence after clashes left seven people dead on Monday. The National Electoral Council’s decision to audit all the paper receipts of electronic votes is seen as a major concession to the opposition. The council had earlier audited 54% of the vote and said this showed that Nicolas Maduro, the chosen successor of the late President Hugo Chavez, had won a slim majority. The official count indicates Nicolas Maduro won 50.8% of votes to Henrique Capriles’s 49.0%. Henrique Capriles said he believed the crucial votes that cost him the presidency are among the unaudited 46% of the vote. He said there were more than 3,000 incidents from Sunday’s poll that needed to be examined. Correspondents say the announcement comes as a surprise to many after the electoral body initially said the results, which it announced on Sunday night, were “irreversible”. The council’s president, Tibisay Lucena, told AFP news agency that the expanded audit was not a recount but would cover all ballot boxes not audited on election day by reviewing a sample two-thirds of them over the next month. Venezuela uses electronic voting machines which register an elector’s decision and then emit a printed receipt for the voter to deposit into a sealed ballot box. For the audit, the receipts will be compared with the electronic tallies, to check for any irregularities. Russian President Vladimir Putin and Cuban leader Raul Castro were among the first heads of state to congratulate Nicolas Maduro on his win. The governments of Brazil, Peru, Ecuador, Colombia, Bolivia and Argentina, among others, have also voiced their backing for Nicolas Maduro’s victory. But the US has so far refused to recognize Nicolas Maduro’s win, calling for an audit of the results. Secretary of State John Kerry said the US was not yet ready to validate the results of Sunday’s poll. Several opposition-led protests erupted across the country after the official results were announced on Sunday.